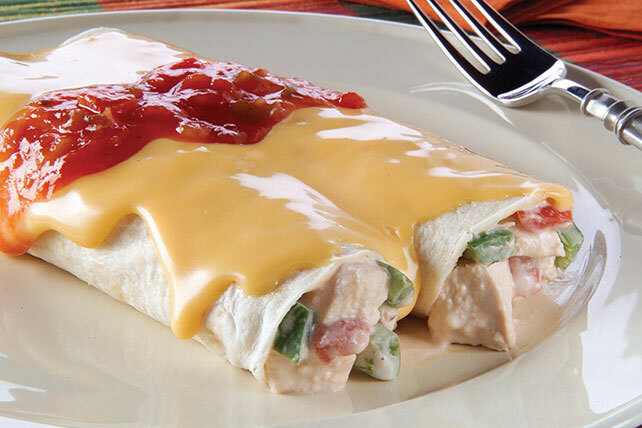 Savor the flavor of this delicious Cheesy Chicken Enchiladas Recipe! All it takes is seven ingredients to turn out a five-star family favorite. Heat oven to 350°F. Mix chicken, peppers, cream cheese and 1/4 cup salsa in saucepan; cook on low heat until cream cheese is melted, stirring occasionally. Spoon 1/3 cup chicken mixture down center of each tortilla; roll up. Place, seam-sides down, in lightly greased 13x9-inch baking dish; set aside. Cook VELVEETA and milk in saucepan on low heat until VELVEETA is completely melted, stirring frequently. Pour over enchiladas; cover with foil. Bake 20 min. or until heated through. Top with remaining salsa. Prepare using PHILADELPHIA Neufchatel Cheese and 2% Milk VELVEETA. Substitute 1 pkg. (6 oz.) OSCAR MAYER CARVING BOARD Flame Grilled Chicken Breast Strips for the chopped cooked fresh chicken.